Guy Learmonth believes his crash diet can help him bulldoze past his 800 metres rivals despite coming sixth at the Indoor Grand Prix in Glasgow on Saturday. The Lasswade prospect, 23, unveiled his new slimmed-down frame for the first time on home soil but his bid slipped through the cracks as Poland’s world silver medallist Adam Kszczot stormed to victory. Learmonth shifts his attention to Sheffield this weekend and the defence of his UK indoor title – as well as chasing the qualifying mark for next month’s world indoor championships. And he maintains his decision to shed the kilos will pay dividends. “I feel more fluid,” he said. “I don’t know how I look but I feel a lot more stable. I’m a work in progress. My coach Rob Denmark has done a lot of work with me and we’ve made big changes in just three months. So I’d like to see where I am in two years’ time. I’m getting there. There were Scottish natives records for Laura Muir (800m), Steph Twell (3000m) and Andy Butchart (3000m) at the Emirates Arena with Mo Farah’s victory in the 3000m topping the bill. And Lothian Road Club hope Sarah Inglis relished her late call-up for the event even though she could come only ninth in the 1500m in a time short of her personal best. “I was just really happy to get a start in the first place,” the Scottish champion said. “I probably could have ran a bit better but it was good experience, to get out there in front of 6000 Scottish people shouting for you. I’ve come along a lot over the past couple of years and this is possibly reward for sticking at it and plugging away. My times are coming down and I’m happy with where I’m at right now. 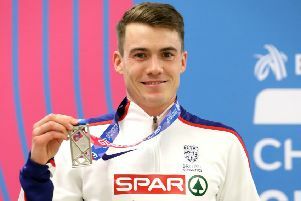 Meanwhile, Capital star Chris O’Hare has a world indoor medal in his sights after lowering his own Scottish record in the Wanamaker Mile in New York. The two-time European bronze medallist, 25, came third in the race in 3:52.91 as American rival Matt Centrowitz took victory for the third time. But O’Hare, who was less than a second outside Peter Elliot’s long-standing UK record, looks to be running into prime form ahead of next month’s championships in Portland. His Edinburgh AC club-mate Lynsey Sharp could not break her own Scottish record as she ended up fifth in the 800m at the same meeting in 2:01.55 as Ajee Wilson took victory.